To start a concierge service, you must first decide what type of concierge business you want to start. Decide specifically what services you will provide based on the type of concierge business you will be (such as personal, corporate, residential). Set prices for the services offered that will suit your target clientele. 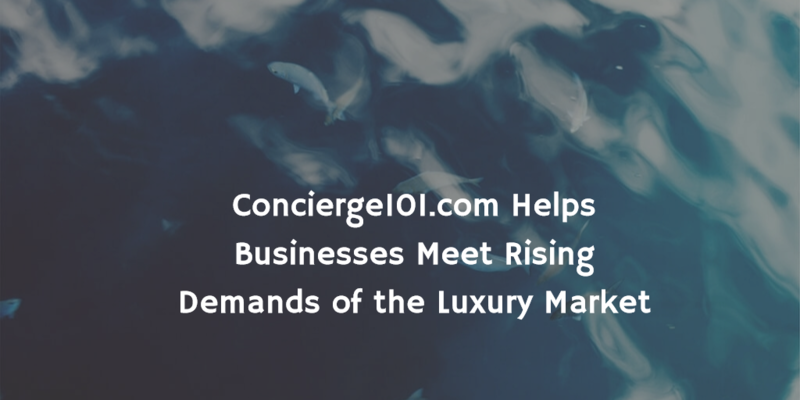 Concierge101.com is an online resource that helps startups launch and operate their concierge or errand service successfully. Visit our blog for industry news and helpful tips on how to start your concierge or errand business today! A concierge business is one of the few profitable small business ideas that does not cost much to start. Business News Daily and other small business trend publications have, once again, listed Concierge/Errand business as a top ten low-cost startup idea. As a millennial, the concierge business is a very viable option, especially if you are in-between jobs. Many concierge and errand startups have come and gone quickly because they thought this business would be as easy as 1-2-3. Concierge services that would have flourished ended prematurely because they didn't take just a little more precaution and time for preparation. Type of Concierge Business - Which One is Yours? 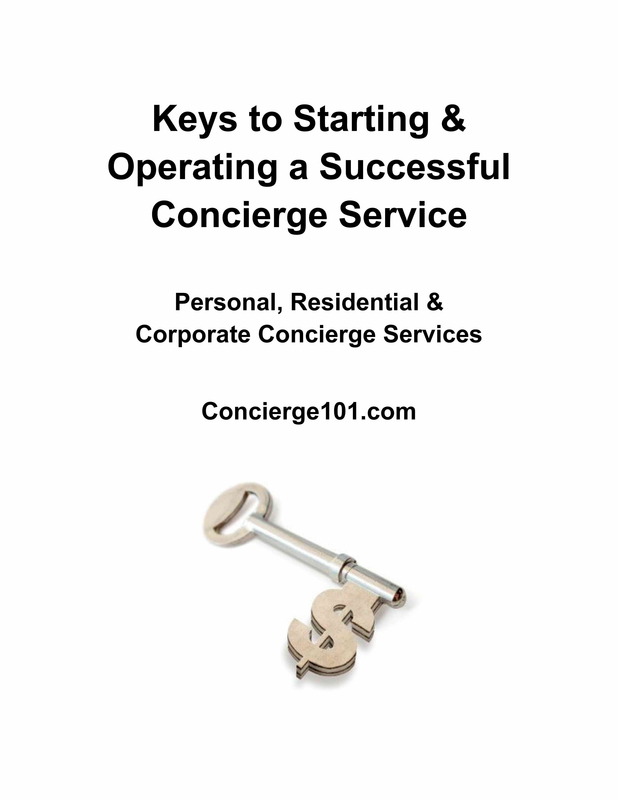 The ebook guide Keys to Starting and Operating a Successful Concierge Service gives you the expert advice you need to start a concierge business. If you already own a concierge business or an errand service, this guide helps owners map out a plan to provide, expand and enhance services and brand. Entrepreneurs in search of a sound, home-based business idea will find ways to create unique opportunities in this thriving industry. As a 20 year veteran still active in the hospitality industry, my team and I currently oversee corporate and residential concierge services for several properties in Las Vegas and Arizona. The skills I've learned over the years are now compiled in one book! 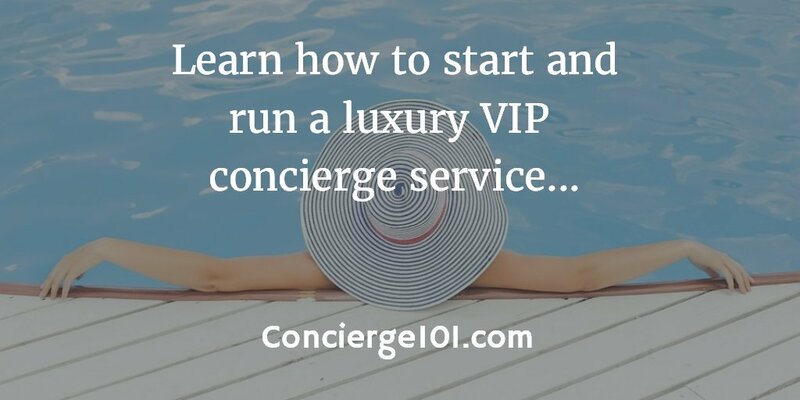 Start a new career as the Lifestyle Manager of your own VIP Concierge Service in just a few hours! Luxury concierge businesses and lifestyle management companies that cater to affluent clientele are competing for an even larger slice of the pie. And investors are hungry to get in on the action! According to Nick Alicastro, vice president of business development at Western National Property Management, "These partnerships create an additional level of convenience for residents and add to the overall appeal of a multifamily community. This increased appeal will ultimately drive traffic to a community, as well as provide opportunities for premium rents." In 2013, Kara Candler weighed the pros and cons of starting a concierge service and decided to take the jump. Since then, she has worked with Sony and Warner Brothers helping run errands for team members while they're in the middle of their shoots. Four profitable years later, Kara has no regrets. Emily White, the former No. 2 exec at Snapchat and Instagram, has a new startup in Los Angeles aimed at providing high-end "concierge" services for busy families, according to Fortune's Dan Primack. The startup, called Mave, was described by a source to Fortune as serving as the "chief of staff for your household." Little else is known about Mave right now. The company has a website, but the site says it's currently an invite-only beta, and that there's a waitlist. The new service would mark an intriguing new chapter for White, following her sudden departure from Snapchat in 2015 after only 16 months at the company. White is among the internet industry's most respected executives, having worked closely with Sheryl Sandberg and later overseeing Instagram's effort to build an advertising business. Foresight Wealth Management, an independent registered investment advisory firm headquartered in Sandy, UT, today introduced comprehensive concierge services to complement the firm's wealth management offering. Foresight Concierge Services, headed by Stephanie Callicot, will help clients with daily needs, in areas that go well beyond finances. Tasks range from running errands and picking up prescriptions, to more complex assignments, like helping to plan for a wedding or anniversary. The concierge team will also be heavily involved in the Sandy community, with an eye on opportunities to give back to local charities and other organizations. Luxury services market grows in China. Read more...Luxury concierge companies are serving a growing number of Chinese uber-rich who want exclusive access to global figures and personalized holiday itineraries, or are simply too busy to accomplish mundane tasks. In an effort to attract more homebuyers to luxury properties and upscale neighborhoods, condo developers are turning to concierge services. In the South of Fifth enclave of South Beach, the boutique condo Louver House will offer a beach concierge service to provide residents with full-coverage umbrellas, sun beds, towels, and a variety of dining options. Since the property, still under development, is about a 10-minute walk from the sand, a chauffeur will shuttle residents to the beach and back. Added service amenities include signature touches such as on-call transportation and a branded paddle board to offer residents the true Miami experience year round. As the number of oceanfront lots dwindled in Miami Beach and the cost of land increased, condo developers turned to non-waterfront properties for their projects. Now, they are looking for ways to entice potential buyers, particularly those who would prefer to live on the water. It is a great time for a concierge business or errand business startup. In many areas where there is significant development in the luxury market (residential and commercial), you will find increasing opportunity for concierge service providers. I remember my first job as a residential concierge, which helped me start a concierge business from home. The knowledge I acquired while employed by an established concierge business set the groundwork for my long-term career as a concierge business entrepreneur and author. Now, it is my pleasure to share with you everything you need to know to not only start a concierge business, but also how to operate a successful one! A personalized concierge service dedicated to high-end travelers promises to take the stress out of conducting business overseas. The company promises to help clients book flights and accommodation, organize transport and private tours, source meetings assistance, organize entertainment and hosting and craft business or networking opportunities. With three children 8-14, she was ready to leave her recruitment career and wanted more control over her daily life. Her in-laws were the inspiration behind starting a business offering concierge services. Get this eBook now for a special limited time price of only $21.95! Note: Click the Return to Merchant button after purchase to access the download page.